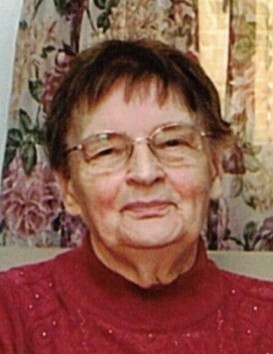 Obituary for Gertrude Leona (Zilney) Blank | Heubner Funeral Home Barry's Bay Ltd.
BLANK, Gertrude Leona – passed away suddenly at her home on Thursday March 28, 2019 at the age of 86. She is survived by her daughter Ann Marie Morehead of Pembroke and son Michael (Betty) of Wilno; Grandchildren Cory (Bailey) Moorehead, Sara (Brandon) Hammer, Janice (Ryan) Carle, Eric and Matthew Blank], Great grandchildren to Jakob and Ashlyn Moorehead and Rylan Carle, brother-in-laws Ambrose (Lillian)Blank and Aloysious (Adele)Blank, also Esther(late Nicholas) Prince. Gertrude was predeceased by her husband Sylvester Blank (2001) and her parents Joseph and Magdalene Zilney(nee Yandernoll), 3 brothers and sister Ambrose (Martha), Frances(Dougall) MacIsaac, Bronis(Nelda) and Walter(Theresa). A visitation will be held at the Heubner Funeral Home in Barry’s Bay on Sunday from 7 – 9 pm and again on Monday from 9 – 10 AM. A Mass of Christian Burial will be celebrated at St. Hedwig’s Roman Catholic Church in Barry’s Bay on Monday at 10:30 AM. Interment to take place in the spring. Donations in memory of Gertrude can be made to the St Hedwig’s Church building Fund or to St Francis Memorial Heathcare Foundation.